Marker.io is a visual feedback capture tool which enables QA testers, project and product managers, designers and clients to submit bugs and issues to developers directly from inside Jira, GitHub, Trello, Gitlab, Asana, and more. Marker.io allows users to capture bugs, explain feedback through annotations and labels, and then report feedback in one-click. A simple-to-use tool for reporting software issues and getting them into our Trello workflow.As a small team, wearing many hats, Marker.io has really streamlined how we develop software. We use it to develop our own Saas platform RunMags.com and also when developing our own website. We used to take screenshots with a regular snipping tool but then had to go into Trello, create a new card and then upload the screenshot. It was tedious so not all issues were reported. With Marker.io that entire process is simplified to one single move! An additional plus is that it's 100% Chrome based so those of us who work with Chromebooks can partake in the bug reporting process. As a small team, wearing many hats, Marker.io has really streamlined how we develop software. We use it to develop our own Saas platform RunMags.com and also when developing our own website. We used to take screenshots with a regular snipping tool but then had to go into Trello, create a new card and then upload the screenshot. It was tedious so not all issues were reported. With Marker.io that entire process is simplified to one single move! An additional plus is that it's 100% Chrome based so those of us who work with Chromebooks can partake in the bug reporting process. I'd like to have the same simple tool for phones and tablets. That would really simplify reporting responsiveness issues. We actually have a mobile app connected to marker.io. You can now take screenshot of a bug in your phone or tablet and create an issue in your Jira/Trello, etc with Marker.io. We automatically attach all the information of the device you were using when you took that screenshot. Learn more https://marker.io/mobile or go in your dashboard to download it. Excellent alternative to issue trackers if used with Trello. Ease of use and comes with lots of functionality like full page or desktop screenshots. Integrations to Trello, Jira and Github or just get the sharable link and paste it where needed. A deep integration with Browserstack would be a huge win for our QA team as the developers will immediately know on which device a certain bug was captured. The ability to create cards on the fly without even having trello open is absolutely remarkable. This product has changed the way we do release management and bug testing. Not to mention I can organize to multiple boards at a single instance. Honestly my cons for this product are few. Honestly I think you should bring back the legacy plan that my team is currently on. I have reccomend to a few small teams who would like that feature. Other than that just a few quirks with the UI. Mainly the pull direction when drawing arrows. We now support a custom bug report template help your colleagues & clients report bugs that fit your developers' needs. Just go to your dashboard and you'll see this a new tab allowing you to edit your bug report template. Marker.io has been an excellent product to help us manage our software development. I am the support manager for one of the products that my company develops, and so Marker.io has made communicating things with my development team extremely simple. - The GitHub integration means I can post new issues quickly and efficiently, vs. having to take a screenshot, mark up the screenshot, and then upload it to GitHub. - The fact that most of our GitHub items for our repository are right there when creating an issue with Marker.io means I can create an (almost) complete issue with all the tags, assignees, and information already in the issue without having to jump to GitHub to add these things. - All of the data it captures about my environment is helpful to my development team, so they get a clear idea of the situation. In fact, my team has had such good success with Marker.io that another one of our products in the company now uses it as well. The only thing I would say I dislike about the software (and I don't even really dislike this, it's just the one thing that I think is missing) is that you can't assign the issue to a project. That is the one thing that I still have to go into GitHub to do after creating and posting an issue with Marker.io. Organization: Contact Marker.io for pricing information. Marker.io plugs directly into existing issue tracking tools, thereby ensuring there are no duplicate issues (single source of truth) or workflow changes (easy team and client adoption). Browser extensions allow users to capture ideas, bugs, and issues from any webpage. Users can save screenshots through existing tools, including Trello, Jira, Slack, GitHub, Bitbucket. Annotations and assigned labels help users clarify their feedback. Users can create clear bug reports quickly and easily. Below are some frequently asked questions for Marker.io. Q. What type of pricing plans does Marker.io offer? Q. Who are the typical users of Marker.io? Q. What languages does Marker.io support? Q. Does Marker.io support mobile devices? Q. 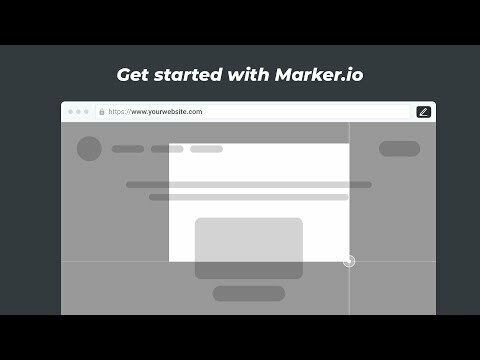 Does Marker.io offer an API? No, Marker.io does not have an API available. Q. What other apps does Marker.io integrate with? Q. What level of support does Marker.io offer?